Fresh ginger can be substituted for ground ginger at a ratio of 6 to 1, although the flavors of fresh and dried ginger are somewhat different. Powdered dry ginger root is typically used as a flavoring for recipes such as gingerbread, cookies, crackers and cake, ginger ale, and ginger beer. The medical form of ginger historically was called Jamaica ginger; it was classified as a stimulant and carminative, and used frequently for dyspepsia and colic. It was also frequently employed to disguise the taste of medicines. Ginger is on the FDA's "generally recognized as safe" list, though it does interact with some medications, including warfarin. Ginger is contraindicated in people suffering from gallstones as it promotes the production of bile.Ginger may also decrease pain from arthritis, though studies have been inconsistent, and may have blood thinning and cholesterol lowering properties that may make it useful for treating heart disease. Ginger has been found effective in multiple studies for treating nausea caused by seasickness, morning sickness and chemotherapy, though ginger was not found superior over a placebo for pre-emptively treating post-operative nausea. Ginger is a safe remedy for nausea relief during pregnancy. [Ginger as a remedy for motion sickness is still a debated issue. The television program Mythbusters performed an experiment using one of their staff who suffered from severe motion sickness. The staff member was placed in a moving device which, without treatment, produced severe nausea. Multiple treatments were administered. None, with the exception of the ginger and the two most common drugs, were successful. The staff member preferred the ginger due to lack of side effects. Several studies over the last 20 years were inconclusive with some studies in favor of the herb and some not. A common thread in these studies is the lack of sufficient participants to yield statistical proof. Another issue is the lack of a known chemical pathway for the supposed relief. A variety of uses are suggested for ginger. Tea brewed from ginger is a folk remedy for colds. Three to four leaves of Tulsi taken along with a piece of ginger on an empty stomach is considered an effective cure for congestion, cough and cold. Ginger ale and ginger beer have been recommended as stomach settlers for generations in countries where the beverages are made, and ginger water was commonly used to avoid heat cramps in the United States. In China, "ginger eggs" (scrambled eggs with finely diced ginger root) is a common home remedy for coughing The Chinese also make a kind of dried ginger candy that is fermented in plum juice and sugared which is also commonly consumed to suppress coughing. Ginger has also been historically used to treat inflammation, which several scientific studies support, though one arthritis trial showed ginger to be no better than a placebo or ibuprofen for treatment of osteoarthritis.Research on rats suggests that ginger may be useful for treating diabetes. A pack of ginger powder,In the West, powdered dried ginger root is made into capsules and sold in pharmacies for medicinal use. * In Burma, ginger and a local sweetener made from palm tree juice (Htan nyat) are boiled together and taken to prevent the flu. 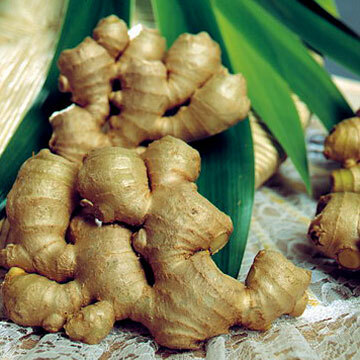 * In China, ginger is included in several traditional preparations. A drink made with sliced ginger cooked in water with brown sugar or a cola is used as a folk medicine for the common cold. * In Congo, ginger is crushed and mixed with mango tree sap to make tangawisi juice, which is considered a panacea. * In Indonesia, ginger ("Jahe" in Indonesian) is used as a herbal preparation to reduce fatigue, reducing "winds" in the blood, prevent and cure rheumatism and controlling poor dietary habits. * In the Philippines a traditional health drink called "salabat" is made for breakfast by boiling chopped ginger and adding sugar; it is considered good for a sore throat. * In the United States, ginger is used to prevent motion and morning sickness. It is recognized as safe by the Food and Drug Administration and is sold as an unregulated dietary supplement.